We just returned from a trip to Marco Island, on the Gulf coast of Florida. 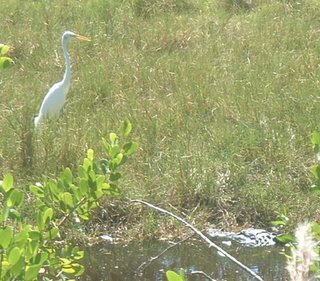 One of the birding highlights was our visit to the Ding Darling National Wildlife Refuge on Sanibel Island. That's where I took this photo of a Great Egret being stalked by an aligator. I hadn't known this, but Ding Darling was an editorial cartoonist in the first half of the last century, and an influential conservationist. Many of his cartoons regarding wildlife conservation are still perfectly relevant in today's society. I bought a CD of his cartoons and I'll post some of them.